During the Renaissance period, there were no equals sign, no rainbow flags nor pink triangles to openly express being gay. To show one was gay, they simply wore a blue feather in the cap. We see today the yellow equal symbol on blue background which represents a very worthy organization which if seen on a vehicle, shows that the driver is gay or gay friendly. During the gay pride movement, the rainbow flag was created in the late 1970s to show pride in the gay community. The upside down pink triangle was a symbol taken back in pride from the Holocaust. During that horrific time, as Jews were required to wear yellow stars, those that were homosexual were required to wear upside down pink triangles. The Renaissance period, especially around Florence though used elsewhere as well, had their own mark of pride. Many that are history buffs of the Renaissance period don’t know about the blue feather because it was not widely known or openly discussed. If you were male looking for male companionship, then one would place a blue feather in their cap to show they were looking. Perhaps it is also a predecessor of the hanky code, which is an entirely different topic not relevant to here. Today, the blue feather is seen throughout the SCA as a symbol of unity. There is a difference between dark blue and light blue feathers. For those that are LGBT, they wear a dark blue feather. For friends that are supportive, they wear a light blue feather. KAOTIC MYTHICALS is proudly & openly gay owned & operated. We are the only openly LGBT friendly troupe in NorCal. We display the blue feather banner as a symbol of pride and to show others that we are accepting of all without discrimination. 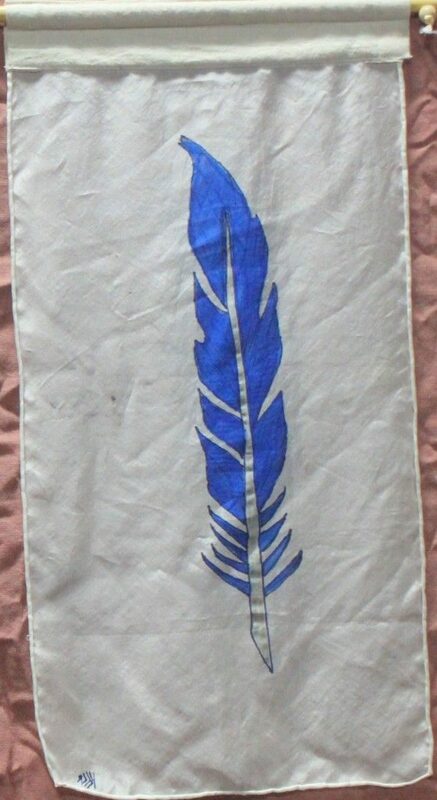 The blue feather banner can be seen hanging in our encampment at every event to educate those that inquire. For those that are blue feather, the banner is proudly displayed to show our encampment is a safe & welcoming space. We gladly welcome those that are LGBT in our encampment where they know they will be treated with respect, acceptance & understanding. Sadly in this day & age, there is still discrimination, even at festivals & events that we participate at.